Chili soup, cooking, recipe, Whatever Happened to Dinner? What do you like with your chili? I grew up eating chili soup with crackers—lots of crackers when I was little. There were so many crackers in the soup you could barely find the kidney beans or the liquid. I really liked crackers. But I think I also always liked the soup, the way my mother made it, which is nothing like I make chili today. I like her soup—er, I don’t think I’ve ever met a chili I didn’t like unless it is just too stinkin’ hot, as in spicy. Mama’s soup was mostly hamburger, (chunkier than mine,) tomato juice, kidney beans, onion, and chili powder. No garlic. It was a thin, juicy soup that I sopped up by applying crackers, probably 8-10. That was my thickener. I also ate buttered crackers as my side dish. Then I grew up and moved away and discovered there was a whole world of chili soup out there, and at least 50 different ways to make it. Host a chili cook off, which our office did, (below) and there were at 5 or so distinctively different tastes, all of them delish. But my standard “go to” for home is this basic recipe: (and it seems like when I offer people a choice of dishes when my church friends take food to people after surgery or family illness, they frequently choose chili and cornbread, especially in the winter). 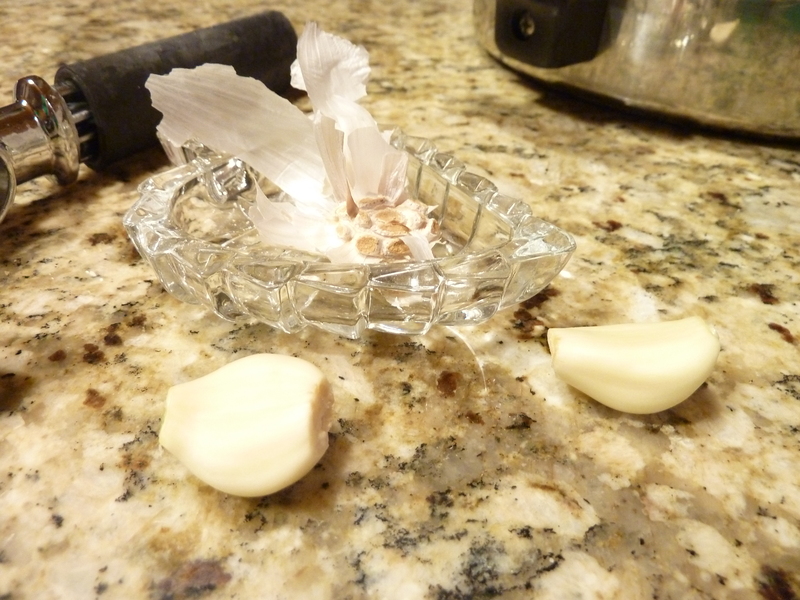 Sauté garlic and onion. 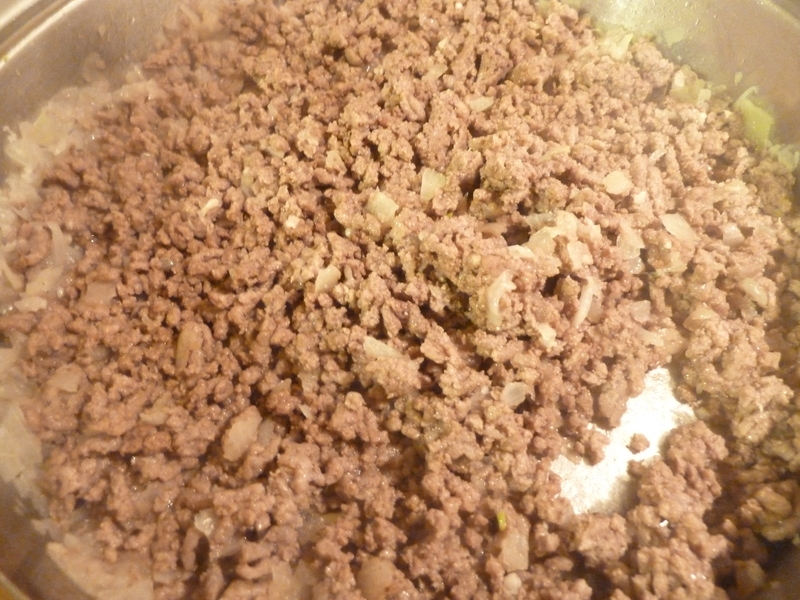 Add ground beef. Chili before it has simmered. 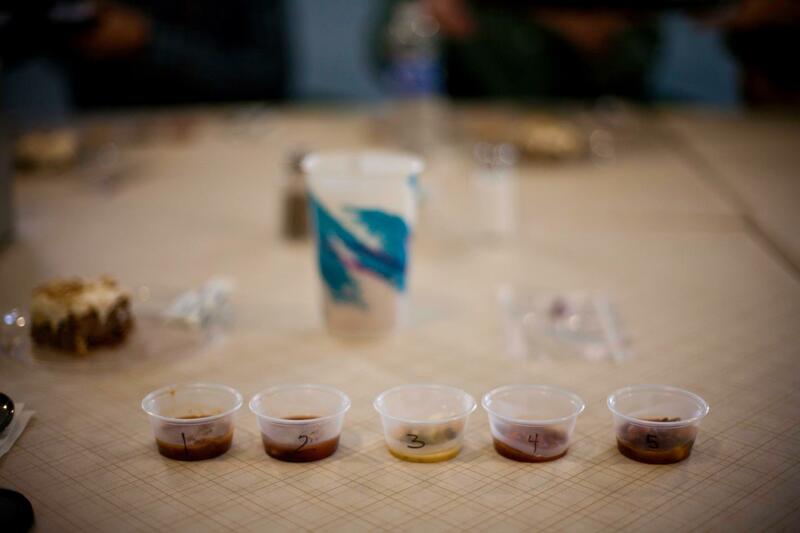 Next question: What do you serve with your chili? Crackers? Cornbread? Tortilla chips? Other hot bread? Grilled cheese sandwiches? Our tradition is cornbread. And I have a really really easy recipe that uses liquid shortening (vegetable oil or other) that you can easily whip together while the soup simmers. I will share it sometime. Whatever Happened to Dinner: Recipes and Reflections on Family Mealtime. My mother’s chili is similar to yours…tomato juice, whole tomatoes , ground beef, chili powder, onion, celery and lots of kidney beans. She adds elbow macaroni though. I also make a vegetarian chili with kidney, black and canneloni beans, corn , onions, celery, carrots, zucchini, tomato juice, whole tomatoes and spices. I serve mine over elbow macaroni topped with cheese, onion and plain yogurt. Nobody here uses crackers. Sometimes I made cornbread, but we have the noodles already as a starch. Neither version is very hot. My husband will add hot sauce to his. 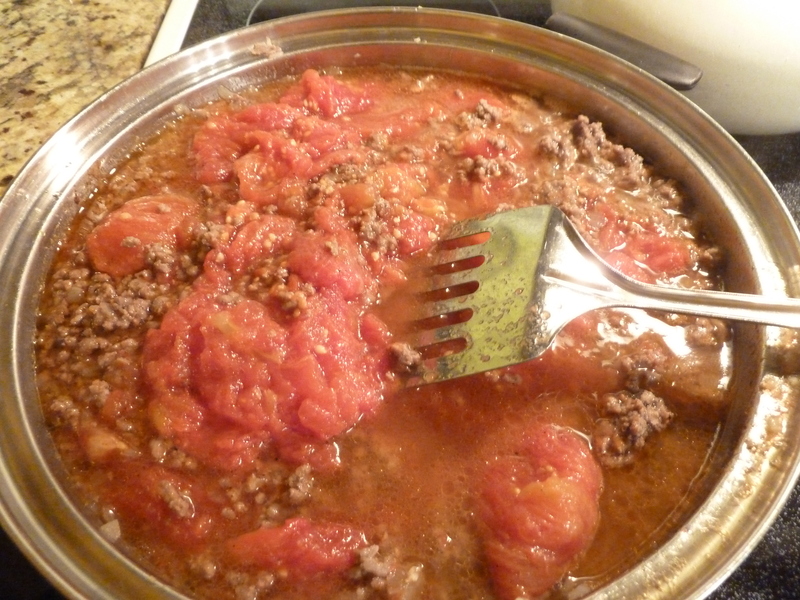 We went to my daughter and son-in-law’s yesterday (hence why no reply yesterday) and he had made a delicious thick very filling chili with bacon, hamburger, kidney, brown, black and something else–oh and using ketchup, among other sauces. It was like a casserole. I added shredded Parmesan cheese to mine–always good. I love hearing about all the different ways to fix it. Stay tuned, if I can get my sister to share her “white chili” recipe it was also a new discovery over our Christmas holidays that is worth making!